It was a warm Saturday evening in October – a perfect night to get dressed up for the Theatre. We arrived a bit early and wondered where we could go for a drink. One of the theatre crew suggested the White Horse Inn Cocktail Lounge around the corner. An enthusiastic General Hospital fan, who flew in from Baltimore to see the play, overheard our conversation and asked if she could join us. Thankfully, our buddy didn’t lead us astray as the White Horse is a friendly place - family owned and they make you feel at home. We got to know our new friend Frances. She admitted she was a Jason Thompson fan and followed him on the Soap Tour circuit. I had no idea such a hobby existed. We were there to support our good friend Carolyn Hennesy and a little eye candy courtesy of Nathan Parsons was an added bonus. 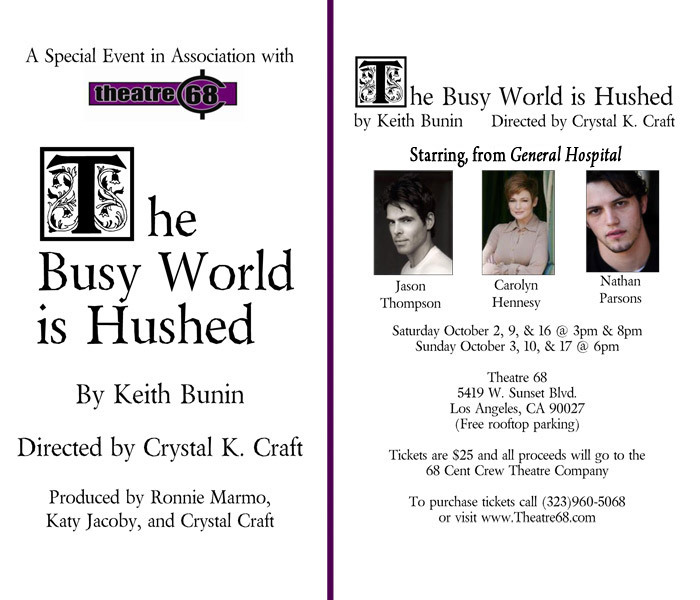 The Busy World is Hushed (directed by Crystal Craft and produced by Ronnie Marmo) features General Hospital castmates Carolyn Hennesy (Hannah), Nathan Parsons (Thomas), and Jason Thompson (Brandt). Hannah, an Episcopal minister and theological scholar, finds her faith at odds with her estranged, wayward son Thomas, who happens to be an atheist. Brandt, an inquisitive young-writer hired by Hannah to assist with her latest publication, finds himself in the middle as the unsuspecting catalyst between Hannah and her son. It’s a thought provoking play about life, loss, and religious contradictions that is delivered with wisdom, humor, and insight. Carolyn gave a riveting performance in a role that was a departure from both Diane Miller and Barb. Nathan was quite charming, energetic, and very fluid on stage. His role as Thomas was a little reminiscent of his GH Character Ethan Lovett. This was Jason’s theatre debut. For a newbie he was rather convincing, and he played off against the seasoned veterans quite nicely. His brother was in the audience to cheer him on, and Anthony Geary (Luke Spencer on GH) was also there to show his support for his fellow castmates. If you’re a GH fan this is a great opportunity to see Carolyn, Nathan, and Jason in an intimate setting. You’ll also have an opportunity to meet them after the show. But, you better hurry and get your tickets. The play closes this weekend. There are two showings on Saturday October 16th (3p.m. / 8 p.m.) and the final showing is Sunday October 17th at 6 p.m. Tickets are $25 and can be purchased at http://www.theatre68.com/. All proceeds go to the 68 Cent Crew Theatre Company, so support the arts! Theatre 68 is located at 5419 West Sunset Blvd. (east of Western), and they have free rooftop parking. It was great having a drink with you two on Saturday. While I did travel across the country to see Jason Thompson's theater debut, I was completely impressed by Carolyn and Nathan. You can definitely see their stage experience. I went again on Sunday and all were equally impressive. The best part of live theater is while the words are the same and the characters are the same, watching the actors respond to subtle differences makes each show enjoyable and a new experience. It definitely was worth the weekend 'jaunt' to LA.